Most of you would have seen my Instagram updates of my brand new hair colour, and a lot of you have emailed me already, asking about the process and price. I've put together a little video of the process, and my overall experience with Oscar Oscar Salons, at their brand new salon in Highpoint Shopping Centre. It looks absolutely gorgeous, glossy, and so chic! Most of the process is explained to you in my video (embedded below), so here are just a couple of pictures to show you the overall process and look of the salon. I must say that the overall experience being at Oscar Oscar was an extremely pleasant one. Everyone was incredibly professional, and my hairstylist did a bang up job at Balayage-ing my hair. I did a little bit of research on the Balayage technique, and it takes quite a bit of skill if you want to get it done right, because you have to pick out the pieces of hair that you think would catch the light more, and be able to graduate the colour well from the roots to the tip, because otherwise you get that very stark dividing line between the darker and lighter colours in the hair. I am glad to report (and you will see in the pictures) that my hair suffered no such fate, and I am so incredibly happy with the results of the Balayage! By the time I was done, I was a whole different person! I felt really good about the end result, and the curls they gave me were so glamorous I couldn't bear to wash my hair after. Thank you so much to the team at Oscar Oscar for giving me the best hair colouring experience I have had in a very long time, and if you're interested in getting your Balayage on at an Oscar Oscar salon, check their salon locations out here. Also, I have a little bonus for all Emily's Anthology Readers! 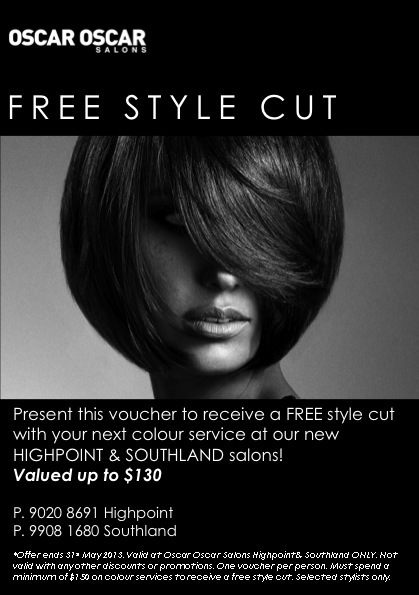 Get a free style cut with your next colour at Oscar Oscar if you are a Highpoint or Southland customer! Just print this voucher and present it at your next appointment.